Is Trade360 A Solid Trading Platform? Read this review! The business of trading is constantly evolving and so are the trading platforms. Sure enough, MetaTrader 4 is still a dominant force within the trading community and a large number of traders swear by it. 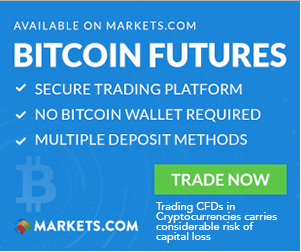 However, new trading platforms such as Trade360 are appearing every day and some of them are introducing us to new technologies that are supposed to make trading a whole lot easier. Trade360 is a brand new trading platform that uses an unique concept of crowdtrading. Trade 360 is one of the new trading platforms that appeared in the last couple of years and even though it looks like one of the social trading platforms, the idea behind it is a bit different. Trade360 Forex broker gathers the information from large groups of traders and share their insights and knowledge with its members. As far as we have found, Trade360 is a real business that has full European regulations and they have never been connected to any Trade360 scam. A broker who follows rules and regulations is typically safe to trade with so this is a plus. They advertise their CrowdTrading as a brand new concept which will teach you all the right steps you need to take in order to reach the trading success. Although it might seem innovative, it isn’t. Instead of listening to a trading expert, you are tuning in to the opinions of a large number of people. Trade360 FX broker trading platform is accessible from any browser or device. That makes trading a lot easier since your account will be available to you at all times. There is no doubt that using this trading platform is not complicated. You will not get lost or make a wrong move unintentionally. Just like the majority of trading platforms, it offers various charts and data to its users. The data is easily accessed and neatly organized. The feature that is the driving force behind Forex broker Trade360 is the information they are collecting from a large group of traders and you will have an access to that right there in your trading platform window. You will be recommended a course of action you should take from the crowd’s opinions and advice. 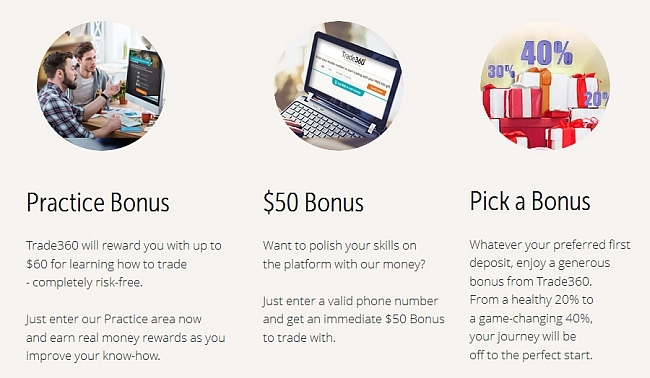 Trade360 offers just one type of an account which can be seen as both good and bad. Your first deposit should be $25 and you are good to go. You will be offered a couple of bonuses such as practice bonus which can be used to learn how to navigate the trading platform or just a simple $50 bonus which you’ll receive after registering. 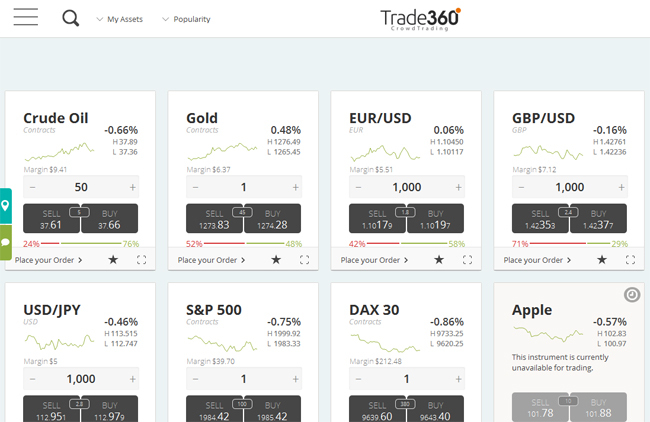 Even though Trade360 trading platform does look rather well designed and easy to use, it is not offering anything spectacular to its users. Yes, they claim that Crowdtrading is a brand new concept but when you think about it – it is not. There are plenty of trading communities out there that will offer you the same type of trading advice. While researching for this Trade360 review, we have come to a conclusion that even though the initial deposit is low and it might attract plenty of traders, Trade360 do not offer plenty of innovative tools to their members. It simply might not be worth it. Trade360 Review	Overall rating:	1	out of 5 based on 1	reviews.